Mark Waid and Chris Samnee have been on quite a roll with Daredevil for a few years now, and Daredevil #13 finds the two creators presenting another interesting take on this sets of characters. In particular, Waid and Samnee take the “damsel in distress” element of superhero comics, and applies it to Kirsten McDuffie, Matt Murdock’s partner and girlfriend (and I do imagine she would place these attributes in that order). The issue also sets up what looks to be the next major threat faced by Daredevil. 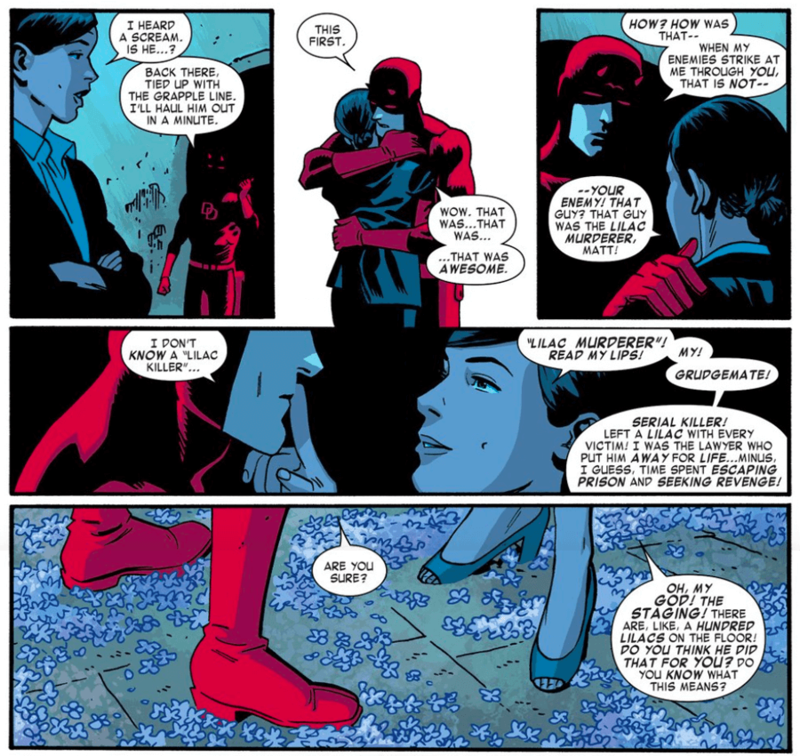 It’s understandable that Matt Murdock would feel strong concern for the well-being of Kirsten McDuffie. For one thing, his identity is now public and it’s also public knowledge that the two of them are dating. So not only does Murdock have a target on his back, he’s placed one on hers. Also, Matt does have a history (like most male superheroes, if you think about it) of having bad things happen to his exes: Karen Page became a junkie, Elektra became dead, and his wife Milla went insane. However, Kirsten takes umbrage to his paternal concern for her, believing that she’s shown that she can take care of herself. It appears that Matt’s paranoia is well-founded when Kirsten is kidnapped while lunching with her father (who is also concerned for her safety). Daredevil quickly deduces that no one was seen leaving the restaurant because they escaped through the basement. There Daredevil confronts the kidnapper, telling him that his beef is with Daredevil, so he should leave Kirsten out of this. However, he’s totally wrong. Kirsten’s kidnapper is the “Lilac Murderer,” a serial killer who Kirsten sent to jail as D.A. He is after her, not Daredevil – though Matt does capture the Lilac Murderer, with an assist from The Shroud (returning to the series). It’s a clever take on how Matt sees Kirsten, and the inherent sexism (though well-meaning) of it. The Lilac Killer shows that Kirsten is important enough of a presence to warrant her own enemies. Kirsten McDuffie is a character that Waid and Samnee created for this series, and they’ve been doing a good job of making her an interesting, likeable and complex character. So it’s nice to see her get highlighted in Daredevil #13. There is also a new threat introduced in Daredevil #13, who is using hacked electronic devices to spy on Matt Murdock. It’s not really a new threat because it’s Matt’s old foe The Owl. Clearly, the end game of The Owl is well developed, as he is gathering information to be used at a future date. He also seems to have an array of new powers because in addition to possibly controlling the electronics, he also has The Shroud, who Daredevil views as an ally, under his control. 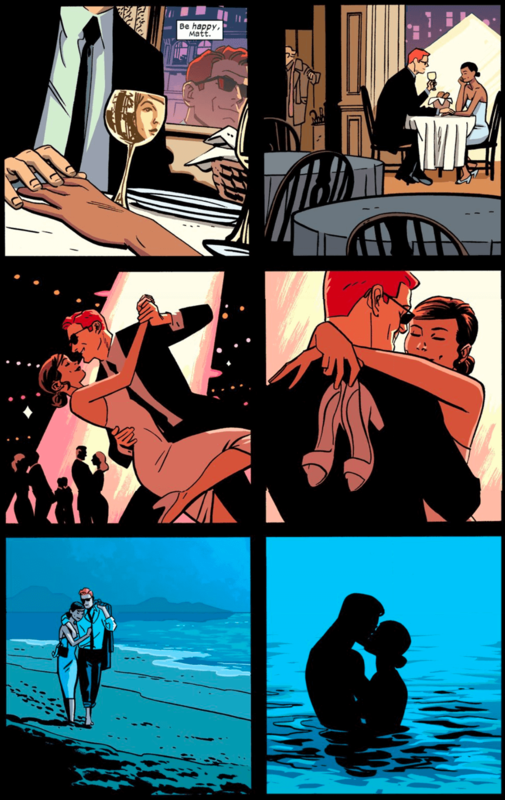 The art of Chris Samnee, along with the coloring of Matthew Wilson, is fantastic in this issue. In particular, there is one page where the individual panels are aligned in such a way that a different image is viewed when the panels are viewed as a whole. The reveal of The Owl, while not totally clear, also looks pretty great. There are subtle indications that it’s The Owl from the cover as well, though I could see it being a little confusing if a reader missed that clue. Waid and Samnee have also been doing something unique in today’ comic book world by producing issues that often can stand well on their own. They don’t require the previous five issues or the next five issues for it to make sense (ahem, Hickman). At the same time, these single issues or short arcs usually build into longer, serialized stories that utilize parts of the issues to build to something larger. That can be seen neatly in Daredevil #13, as the issue reads well on its own, but also introduces elements of The Owl’s game that are sure to develop of the next series of issues.